Original Kids Disney Print Rain Boots is rated 4.6 out of 5 by 280. A mini version of the iconic Original Tall Boot, the Original Kids Rain Boot is a dream for junior explorers. 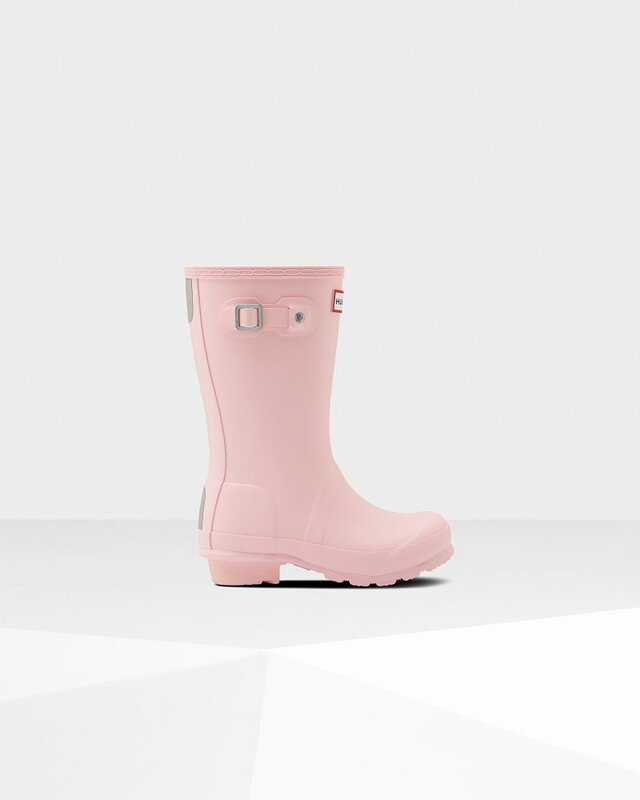 Pretty in pink, this pastel boot is handcrafted from natural rubber. Designed for adventures, our specialized kids rain boots are highly resistant to wear and abrasion with a polyester lining for comfort. Reflective patches and the Hunter Original tread offer added safety so you can be confident letting them take on the elements whatever the weather. Rated 4 out of 5 by MAB1 from Great boots, very neon though! Great discount on these boots, the color is neon pink though. Rated 4 out of 5 by Sunkissed from Good Quality Hyper Pink Gloss ordered the Hyper Pink wellies three days ago and just received them. The boots are serving the same authentic Hunter promise....quality, style, comfort, wet protection, duralbility and versatility. Im satisfied and i would've rated them a five star however, the color was a little too bright for my liking. When ordering on line colors can be appear darker or lighter. The Hyper Pink Gloss image on line to me, appears to more as a watermelon pink. However, once i received my boots i was a little discouraged because they look like a neon pink or neon coral pink. Im 4'9" in height and i wear a size six in womens shoes. I suffer from multiple sclerosis and I prefer Hunter wellies over most of the boots i own. Hunter boots offer me the support and comfort i need when walking or standing for periods of time. My size in the Hunter Boot is a size four in big kids and they fit perfect. The height fits about mid calf on me.